Back from NSS and I'm completely pooped. So, just gonna make it quick and show the cards created by our Design Team for today's highlight of Sightseeing. Pretty awesome set, isn't it? My fave is the bridge, so much fun, you can even stamp little lights onto them or just draw them in yourself. 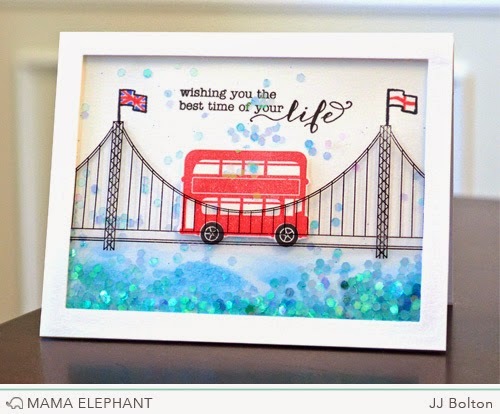 JJ created a fun shaker card with the Sightseeing set! I love the way the bridge is stamped on the acetate to give it more depth! Pamela made a night scene with the double decker and the bridge. The bridge and the snow was stamped on acetate and adhered with foam tape to create a slight shadow against the back. 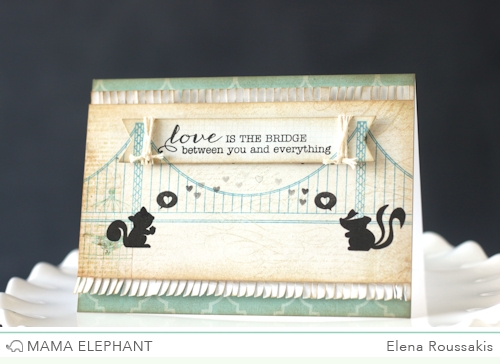 The little critters from tree friends look extra cute in front of the bridge! Elena grounded her images with the sentiment banner up top, stamping the bridge onto the banner as well as the panel underneath. 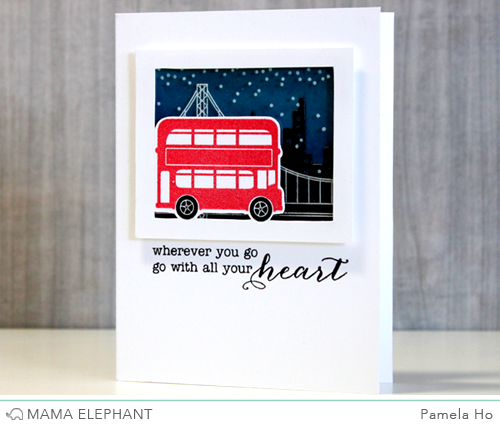 Laura created a clean and simple card using the coordinating die cuts for the double-decker bus. Geralyn created a cute little scene with the double-decker bus and bridge. She added some watercolor detail and handlettered the sentiment to finish the card. Emily created a graduation card for her son by creating a double-decker school bus. She accented the flag with a little heart to emphasis the two-colored sentiment and used the flag detail as exhaust. Cityscape and Femme Frames Creative Cuts complete the scene. There's a new bridge in St. Louis,MO, that looks somewhat like this bridge. This will be a good stamp set for me to get. The cards are great. I have never been on a london double decker bus but I would love to and this stamp set is so adorable. I've said it before and I'll say it again. Best DT on the net. Such a great set so many elements to work with great job by the DT love the variety of cards awesome job gals! i love these inspiration cards! Love these stamps! Especially this night scene with the bus. It's awesome! What a great idea to use acetate! Will have to do that! Great inspiration!!! all cards are so lovely!!! All of these cards made from the stamp set is so elegant. Thanks for the inspiration! Wow this set is just amazing and the DT is unbelievably talented. I'm green with envy over their magnificent talents. Loving all the DT inspiration!! !